Brooklyn Bedding Signature Mattress Review | Best Mattress Ever? In this review of the Brooklyn Bedding Signature mattress, we take a look at the company’s updated best selling hybrid mattress that they recently released on the market. The Brooklyn Signature mattress uses a combination of foam and coils to create a best of both worlds feel and at a great price. As noted, this is an updated version of the brand’s flagship model, which they label the #BestMattressEver, and in this review we put it to the test to see if it lives up to that label! 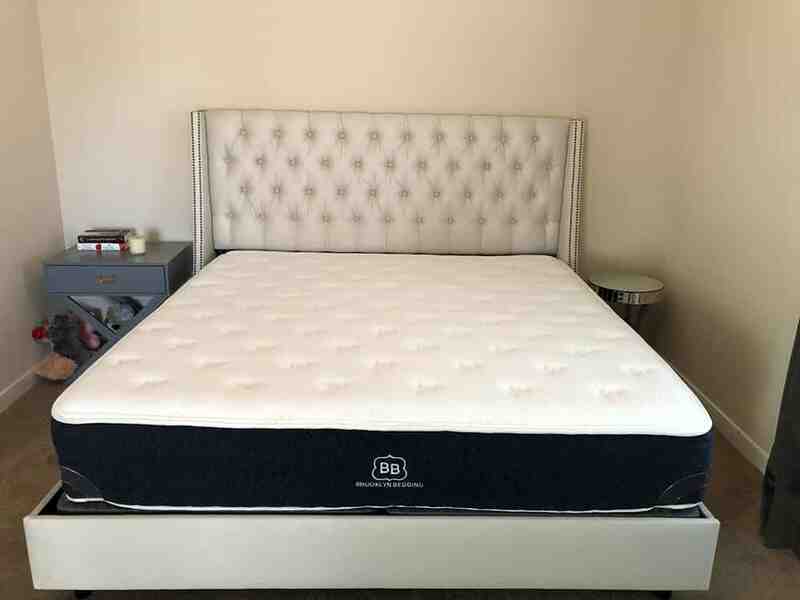 We have also reviewed the company’s Aurora hybrid mattress and their all foam Bowery mattress as well, so take a look at those reviews as well for our review of them. This in-depth review of the Brooklyn Bedding Signature mattress evaluates all of the criteria we use to determine what constitutes a good mattress, which includes firmness / support, comfort, sleeping hot, and other features as outlined below. 2″ Comfort Layer – This layer is 2″ of medium firm TitanFlex foam. This layer helps provide responsive comfort and support for the body during sleep, as well as pressure relief and body hug. The comfort layer also includes an infusion of TitaniumGel gel foam that helps promote cooling and an anti-bacterial sleeping environment. 2″ Transition Layer – This layer is made up of 2″ of viscoelastic swirl foam that provides deep compression support for the body, and provide a transition layer between the top comfort layers and the lower support layer. 6″ Support Layer – This layer is 6″ of Ascension individually wrapped coils that provide support for the mattress and deep compression support for the body during sleep. This layer also helps with keeping the mattress cool by enabling airflow between the coils. A queen mattress contains 1024 coils. The main difference between the medium, soft, and firm models is the firmness of the 2″ TitanFlex transition layer and the top cover layer, which is either medium, soft, or firm. The cover ranges from .5″ to 1.5″ depending on if the model is soft, medium, or firm. The cover of the mattress is a soft breathable cotton blend that is quilted to poly foam to create a soft plush sleeping surface. The Signature hybrid is and updated version of Brooklyn Bedding’s top selling mattress, and has been re-designed as a hybrid mattress. As mentioned above, the mattress comes in 3 different firmness options, soft, medium, and firm. We tested the Medium, which we rate at around a 6 out of 10 (10 being the firmest). The Signature feels a little firmer to me, as I am significantly heavier than Kaye, and I tend to press through the top comfort layers and feel more of the support layer of springs in the mattress. The hybrid design of the mattress delivers the advantages of both innerspring and foam beds that these beds are known for. The elasticity of the TitanFlex material that imparts sort of a latex feel, combined with the innerspring core, gives this mattress a good degree of responsiveness and bounce, along with decent temperature regulation. In terms of support, the Brooklyn Bedding Signature mattress does a good job of providing excellent support in all sleeping positions. Since Kaye and myself are primarily side sleepers, we like mattresses that provide enough give in the top comfort layer to support our shoulders and hips, while also having the firmness if we switch to our stomachs and backs. Back sleepers and stomach sleepers will also find the Medium version of the Signature good for those styles as well, as it is firm enough to provide support and comfort for those sleeping styles without being too soft and causing excessive sinkage. The coil construction and memory foam layers provide a good degree of bounce and responsiveness with the Signature, and the 11.5″ design really supports heavier sleepers such as myself quite well. We feel that Signature is a comfortable hybrid mattress, with the combination of the foam comfort layers and supportive innerspring coil layer providing a soft upper layer that provides good body hug along with the responsiveness and bounce from the hybrid spring construction. The great thing about hybrids such as the Brooklyn Signature mattress is the features of memory foam which provide body hug and contouring, along with the bounce and support of the springs. Both Kaye and I like this mattress, as it provides the comfort and support that we need individually as well as a couple. Often we are at odds when sleeping on many mattresses, as what one of us likes the other less so. The Signature provides us with the best of all worlds with the feel of memory foam and the support for my heavier weight that the innerspring coils provides. The Brooklyn Bedding Signature mattress does a good job at sleeping cool due to the construction of the mattress, which includes the gel foam material in the cover, along with the cooling properties of the innerspring coil construction. As mentioned, not sleeping hot is something that is a must for us – given that we live in Texas and mattresses can get quite hot during the summer, especially when sharing a bed as a couple. A result of the hybrid design and gel cooling material in the mattress is that we did not get the sticky sweaty feeling that some all-foam mattresses often cause us to feel. As it is a hybrid, the innerspring coil layer promotes airflow and circulation that keeps the bed from sleeping hot. As we always say, sinkage and motion transfer is weight dependent – with my heavier weight (230lbs) causing me to often sink down into some mattresses and cause motion when moving around compared to Kaye, who weighs half of what I do. As a couple, a mattress that has too much sinkage and motion transfer causes problems for us when sharing a bed. Due to my heavier weight compared to Kaye (230lbs vs 115lbs), often when I lay on a mattress my weight will cause me to sink down into the bed, and when Kaye lies next to me she “rolls into” me which is something she does not like at all. This results in us retreating to the edges of the bed away from each other, which doesn’t do much for intimacy or cuddling at night. The Signature mattress does a pretty good job at sinkage, with the 11.5 inch mattress supporting my heavier weight, which is something that I often have a problem with when sleeping on competing thinner mattresses. I did compress through the comfort layers and came to rest on the pocketed coil layer when sleeping on the Signature mattress, and tended to bounce a bit on the mattress when adjusting positions. This was a factor when both sitting upright as well as lying on the mattress when sleeping and something that often is the case with bouncier coil mattresses. Motion transfer was a bit more than desired, again due to the bouncier innerspring coil construction. This is to be expected due to the hybrid design, but if you are used to no movement of all foam mattresses, this could be a little bit of a disadvantage. The design of the Signature caused a small amount of motion transfer between both Kaye and myself when sleeping and changing positions during the night, and this was something that we found a drawback, because we are used to minimal motion transfer with most all-foam mattresses we test. As far as edge support, when I slept closer to the edge of the bed, I did not compress the edges much, and did not “roll off” the edges like with some mattresses that have poor edge support. This is a plus, and something hybrids do a better job at them all-foam mattresses. We did feel each other move around and get up during the night, as my heavier weight would move the mattress to a decent degree when I got up to go to the bathroom in the night, and often disturbed Kaye as a result. In terms of smell or off-gassing, the Brooklyn Bedding Signature mattress gets high marks in this category for not having a noticeable smell upon opening the box, which is something that we definitely felt was a plus. Most foam mattresses experience a degree of off-gassing and odor from being compressed and packaged in plastic for shipping. Not so with this brand, as the hybrid coil design results in a mattress that is primarily non-foam, thus has much less odor than other mattresses. This is a great price compared to most of the hybrid mattresses we have reviewed, and you really get your money’s worth with the degree of quality and materials used in the construction of this bed. The Brooklyn Bedding Signature mattress is a great coil and foam hybrid mattress and one of the best values on the market. Brooklyn Bedding has created an excellent hybrid mattress using premium materials and craftsmanship that is comfortable, supportive, and sleeps cool, all at a very attractive price. The Signature is available in multiple firmness options, which makes it suitable for all sleeping preferences. We found the medium version great for all sleeping styles, be it side sleeping, back sleeping or stomach sleeping. The mattress is supportive and comfortable, with high quality materials and a good hybrid design working together to make a comfortable yet supportive bed. While there was a little more motion transfer than desired due to the bounce and responsiveness from the innerspring coil and foam design, it wasn’t too much to make it disruptive during sleep for couples. Those that are used to innerspring coil mattresses probably won’t see an issue with this, while if you are used to an all-foam bed you may feel its a little on the bouncy side. The Signature sleeps cool as well due to the gel foam top layer and hybrid coil design, and did not have a noticeable odor either when opening the box. All in all, we feel the Signature is one of the better hybrid mattresses on the market today, especially given its attractive price range. We hope that this Brooklyn Bedding Signature mattress review helps you out in your next mattress purchase decision! If you have any questions, feel free to let us know.